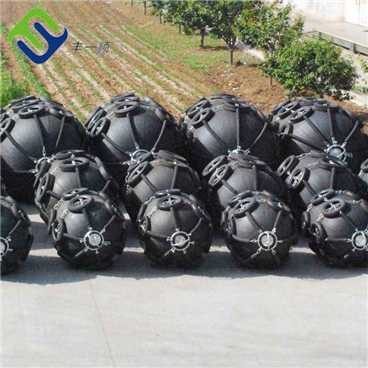 Main Advantages of floating rubber fenderEasy and fast to deployEase of transportation especially for larger dimensions,Website:http://www.marinefenderairbag.com, all in standard transport.Very low reaction, high energy absorptionSuitable for small and large tidal rangesEasy to install and to inflateFloating rubber fender are suitable for many applications including:1. Tankers, Gas Carriers and Bulk Cargo Ships;2. Fast ferries and aluminum hulled vessels;3. Temporary of permanent installations;4. Rapid response and emergency fendering;5. As stand-off fenders to realign ships with shore facilities.Florescence Floating rubber fender specification:SpecificationD*L(m)Initial pneumatic pressure50KPaInitial pneumatic pressure80KPaApplicable ships tonnage (T)Body Weight (Kg)R (KN)GEA (KJ)Body Weight (Kg)R (KN)GEA (KJ)0.5*1.02564625838500.6*1.032748329611501.0*1.5801823280235441001.0*2.010025745125335632001.2*2.01202976316538686300-5001.35*2.5165427102226554140300-5001.5*3.031559715337075121110001.7*3.040563919143683026310002.0*3.5590875308632113842430002.5*4.01050138166311101815925100002.5*5.513332019943141026531317100003.0*5.018802104121021552709157110000above3.0*6.021602583148524703292188810000above3.3*4.520201884117523002476164010000above3.3*6.527003015181430803961253210000aboveFloating rubber fender DeliveryChain and tire net are adjusted on Fender before delivery and all accessories checked. Pneumatic Fenders are deflated and pressed to be delivered on their operating site.Larger sizes are pulled out from their chain and tire nets to be containerised more easily.Floating rubber fender outlookOur clients.